A bittersweet love letter to the city of new Orleans post-Katrina, season two of David Simon’s Treme continues to boast inspired music supervision. 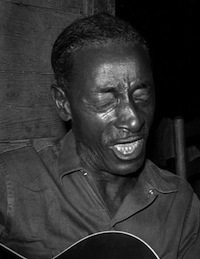 If you tuned in this past Sunday you may have caught the inclusion of Delta bluesman Mississippi Fred McDowell’s “I Wish I Was In Heaven Sitting Down.” If you know the track via McDowell’s album Good Morning Little School Girl, it directly precedes McDowell’s “You Gotta Move,” a song the Rolling Stones paid tribute to via their fairly catholic cover on 1971’s Sticky Fingers. A hunch, but I’ve long been of the opinion that Exile On Main St’s “I Just Want To See His Face” was the Stones own inspired take on “I Wish I Was In Heaven Sitting Down” — if only in vibe/atmosphere alone. I was swimming in this stuff a few years ago while researching/writing our book on the Delta Blues Trail, and have only just recently been able to re-appreciate McDowell and his brethren due to, I suppose, genre over-saturation. It’s good to be back. If you’re relatively new to McDowell, after the Lomax recordings, might I suggest the above and his debut s/t album. Hands down my favorite Blues artist. Thanks for sharing and letting people know about him.